These are wonderful! I wonder if you would be willing to provide measured drawings if you do get access to the medicine box? Or maybe just some drawings. When I first saw the bottles in the window, my first *thought* was "Hmmm...General Lee drank!" I have the same question, if and when you get access to the medicine box. 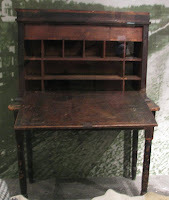 Also the campaign desk would be nice to have drawings. With the increasing number of reenactors, this would be a fun reproduction. 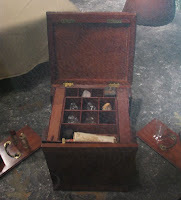 I think you can see from the fuzzy photos, that the box was very well made. And obviously well cared for. You'll probably get a million of these "Me, too!" notes, so I'll try to get mine in early! This was one of 130 exhibits from 38 libraries from around the world - in what must have been one of the greatest exhibitions of library treasures ever. It caused quite a sensation in my town back in 2001. They had to keep extending the opening hours to accommodate everyone until eventually it was open 23 hours a day (they needed 1 hour free to cycle the air conditioning). You could turn up at 3am and there would be a queue of 50-100 people. And this is in a city of only 300,000 at the time. Everyone in Canberra has a story about the Treasures exhibition. The exhibition was only ever shown in Canberra. Quite a coup for our National Library. But amongst the original manuscripts by Mozart, Einstein, Tolkein and Jane Austen, the Dead Sea Scrolls, letters signed by Elizabeth I and Ghandi, ancient maps and some of the most exquisite Korans you will ever see, you can guess what attracted my eye! For some reason they wouldn't let me play with it. It lives at the State Library in Sydney so one day I may get a more detailed look at it. I completely understand why they need to have pieces like these behind glass, but I still hate it. 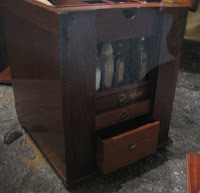 Go to http://www.logancreekdesigns.com/ to see some reproductions of Lee and Jackson furniture very well done. No plans available because he pays royalties to the various museums. Good stuff though. Want to see a shop to make a grown woman cry call me next time you're in Atlanta. 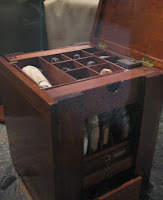 Terry, I read about Joe Cress in an article in Woodwork Magazine about 2 years ago and since then, I've been on the lookout for Civil War furniture. His is a very interesting story and he has a link to the article on his site if you haven't already read it. And you're right, his work is terrific.